As I mentioned in my July 2010 article, “Retracing Colorado’s South Line,” Chandler Robbins was responsible for establishing the monument in 1875 that was later known as the Four Corners monument. He then surveyed south along the west line of New Mexico. In 1878, Rollin Reeves, who was contracted to survey the boundary line between the Utah territory and the state of Colorado, started his survey at Robbins’ monument and proceeded north along the 32° of west longitude from the then-prime meridian of the United States (not the 109° of west longitude from Greenwich—see the July article on why). Reeves’ survey party was escorted by D and K Companies of the Ninth Cavalry. Reeves then tried to either rent or purchase a small boat from a frontiersman several days’ journey away, but the boat’s owner would not part with it. Finally, the river level fell enough that they were able to cross with their equipment, but not without tremendous effort, using a raft for their equipment, supplies, and provisions while wading in water up to seven feet deep in the middle. Reeves’ party then proceeded by first making astronomical observations to determine true north and started chaining the line. At only 34.54chs they had to triangulate over the Navajo Creek, and at 1M 1.66chs they set a point on the south bank of the aforementioned San Juan River and again triangulated a point to the north. This time, however, they required only half a day to cross the river. For the next 130 miles they chained most of the way, having to triangulate only occasionally and setting monuments at each mile usually marked “On the east side ‘Col’, on west side ‘UT’, on north side ‘1878’. 32°WL’, and on south side 47M.” They passed through what is now Hovenweep National Monument noting the many ancient native buildings in ruin. They made copious notes about the terrain, vegetation, and especially water sources throughout the entire surveyed line. They encountered a couple of other locations following their leaving “Hades,” which caused some difficulty. Once they had to triangulate a distance of 2.5 miles because of a canyon with shear walls of 500’ to 1000’ tall. A flagman and an axeman were sent ahead to establish line on the north side of the canyon and were obliged to spend the night without food or blankets rather than travel back to camp. Another time they triangulated a distance of four miles 2.60chs. But the worst country was from 119 miles to 130 miles plus 29.26chs. At the south end of this area Reeves would “cause to be established a prominent and durable monument… Therefore, selecting a white cliff of rocks, very clearly and prominently defined, several miles N. on line, and calling the attention of five members of the party to it (who examined it from the transit with great care)… to reach it they traveled three (3) days and estimate the distance from 25 to 35 miles… This was the worst trail I ever tried to travel.” Upon making the trek they set up their astronomical equipment and made new observations to obtain a latitude and compute the distance from astronomical observations rather than triangulation, establishing their point on line at 130 miles + 29.26chs. They returned on June 2, 1879, to continue their survey north to the northwest corner of Colorado. They established a monument at 276 miles + 60.64chs, being about 28.58chs west of the 262nd mile marker of the previously surveyed Wyoming/Colorado line. I have included these many references to the difficulties encountered by Reeves and his party not only to emphasize what a difficult task their survey was to perform and to show how their difficulties increased as they approached and passed north of “Hades” but also because this story has only been half told. Allen Wilson had spent several years working with Clarence King on his 40th Parallel Survey. When reading about that work I was struck by a seemingly inconsequential remark about how Wilson, upon completing King’s survey, was contracted to complete a re-survey of the west line of Colorado in 1885. This was only six years after the original survey. It seemed odd that a re-survey would be performed so soon after the original. That prompted my investigation, recalled herein. Wilson’s survey was performed from July 13 to September 7, 1885 and covered only the south 210 miles of the line to the White River. He also commenced his survey at Robbins’ monument, which he found “in an excellent state of preservation. Marked as follows: On the N.E. ‘Col 37° N.L., On the S.E. ‘N Mex 32° WL’, On the S.W. ‘Arizona’, On the N.W. 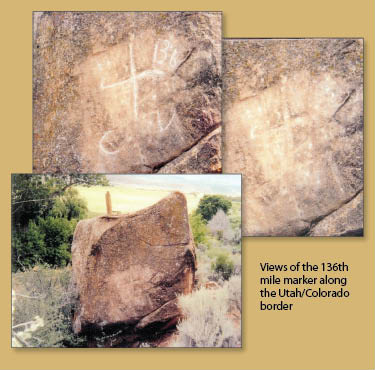 ‘Utah 1875.’” As noted above, Reeves had also found the monument marked as expected, although he didn’t identify the markings, so presumably these are the markings as made by Robbins in 1875. I am not aware of when the term “The Four Corners Monument” came into use, but it seems that Robbins set it knowing it would become just such a corner. Wilson found most of Reeves’ original monuments on line, though starting in the third mile his distances for Reeves’ monuments are from 50chs to 70chs for those monuments rather than the anticipated distance of 80chs. Consequently, Wilson established a second set of monuments at his mile locations. Copies of both Reeves’ and Wilson’s plats are shown here. Where Reeves shows a straight line Wilson shows the angle points. This angle in the Utah/Colorado line is the official line because it was the originally surveyed line, as it should be. But the error by Reeves has resulted in a strip of land, from the 89th mile to the 262nd mile, of about a full mile in width that was originally intended to be part of the Utah territory but is now in Colorado. Let’s not forget that the area of this error is in the exact area that Reeves and his party christened “Hades.” It may be possible that upon returning to Washington, D.C. and receiving Reeves’ official notes, the GLO determined that an error had been made because Reeves did not intersect the Wyoming/Colorado line where expected. Therefore, they may have dispatched Wilson to determine if and where an error had been made and rightly so. Reeves’ survey, being the original, was the official line, so the GLO needed to know exactly where it was. Once having discovered the error, Wilson may have continued to a point where he felt sufficient to verify that there had not been an additional error or possible correction by Reeves. From Reeves’ point of view, after just having completed his survey through hell and then discovering his error, he would have been obligated to return some unknown distance south to re-survey until that error was discovered and then continue on the correct line. All that work probably would have come at his own expense because surveyors generally were paid by the mile in those days. The terrain, as witnessed by all the references to Reeves’ notes, had become increasingly difficult up to and through “Hades,” so this prospect would be not only extremely daunting but also personally costly, to say the least. At that point he probably didn’t know just how far south of his location the error had commenced and how much of the line required re-survey, so it may be possible he made the controversial decision to correct back to true north and continue from where he was, just outside of Hell. 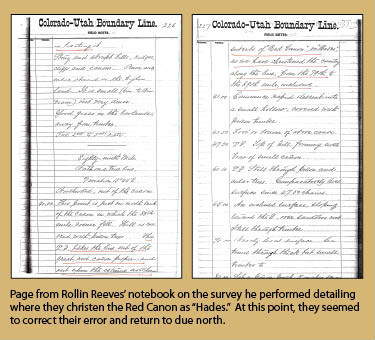 The Colorado/Utah line is where it has been since Reeves’ survey of 1878 and properly so, as his was the original survey. Earl is owner of Zenith Land Surveying, Inc. in Boulder, Colorado. He has been surveying in various states since 1989.